The story of the leaving of Egypt may very well be one of the greatest stories ever lived and ever told in the history of humans on this planet. It’s a story of a people redeemed from hundreds of years of cruel oppression who go on to become a beacon of light for a world that is so often plagued with darkness. It’s a story so fundamental to the Jewish people’s formation and identity that its remembrance is a daily commandment. But it’s only on seder night that we have a once-a-year commandment to actually tell the story. Not because we forgot any of the story’s facts from last year. Not because there’s anything in the Hagaddah that surprises us from year to year. But because in the annual ritual telling of the story around the seder table we receive deep life lessons. Lessons that we need to live the kind of lives that our Jewish tradition wants from us, excepts from us, demands from us. Lessons that are meant to inspire and influence relationships of all kinds that define our lives. Our relationship with God, with family, with friends, with the nation of Israel and others. Amongst all of these relationships, the one we as parents have with our children is probably the most important. 1. We are our kids’ most important teachers. Though we might make our livelihoods as store owners, lawyers or truck drivers, the Jewish tradition bestows upon each and every one of us an honorary degree in education when it comes to our own children. Parents hold the greatest responsibility to tell the story of our people to their children. It is on our shoulders to pass on that which has been passed on to us from previous generations: our people’s history, our values, our beliefs, our mission. The seder is inherently built as a family educational experience, based on the Torah commandment for parents to teach their children about the exodus from Egypt. Jewish sages have taught for centuries that this storytelling is meant to be done in a language, in a manner that our children can hear. That inspires them to want to hear. That imbues in them a feeling that they are the receivers of something exceptionable, something desirable, something unique. Something they feel proud and honored to receive. When we do this well, we give our kids more than a story. We give them a sense that they are part of something much bigger than themselves, an unbroken chain of Jewish history that began thousands of years ago. 2. Every kid is different! Despite the fact that each of our kids comes from the same gene pool, and despite the fact that we often just can’t understand how our kids can be so different if they come from the same gene pool, they can. And they are. From tastes in food to how they react to certain challenging situations, they are different. Like the four sons of the Seder who come to the table with different needs, different wants, different ways of connecting. We need to be aware of where each of our kids is holding in life, what they’re going through and where they’re coming from. From year to year their lives can and do change, even radically. Sometimes from month to month. Sometimes it seems like they change from day to day! It’s not an easy task (and I am not claiming myself as an expert in this), it’s a full-time 24/7 job, but if we can get past our beliefs of who we think our children are, based on who they were in the past or who we want them to be, and see who they actually are, we greatly increase our chances of success in guiding our children in strong and positive ways through all that life throws at them. On some level we as parents have to be masters of forgetting. Forgetting who are kids were in the past and be totally open to and present with who they are today. Understand how what they are constantly going through is constantly changing them and recreating them. We need to regularly update our understanding of our own children for, just like with outdate computer systems, old ways of relating to, speaking to and dealing with our children will just create problems for them and for us. In fact, they most likely won’t work at all. 3. Education cannot be passive. I mean, it could be and often times is, but that’s not real education. The image of teacher at the front of a class and students diligently and silently taking notes might look like education, but it’s not education in the truest sense. Especially Jewish education. Kids need to be actively engaged in their learning experience. They must be primary players as they work towards understanding the world, their people and themselves, not silent and still receivers of information. The structure of the Pesach seder, though compiled in ancient times, seems more of a reflection of modern-day cutting-edge educational philosophies in its use of a multitude of mediums to create a hands-on experience for our children. Through tasting foods and singing songs, analyzing text and asking questions, our children are brought into the experience. Some families also make us of visuals and tangibles for kids to see and to touch to help them better connect and understand. All this we do with the goal of creating an experience that is meant to be, and could be, one of the most profound moments in a child’s Jewish education. 4. Let the kids ask questions! Let them know it’s okay to ask. About anything. As parents we need to create a space in which our children feel safe enough to express to us their doubts and their uncertainties, not only amaze us with their intellectual wonderings and curiosities. But allowing the question is just the beginning. We need to hear in our children’s questions not only a request for information or even an answer. Often times a child doesn’t know exactly how to express what is in his/her heart. A question is formulated, but the real question is hidden, as if in secret code, within the question asked. It’s our job to listen closely and figure out what they’re really asking, what they are really looking for, so that we can be true life-guides for our children. 5. Our actions are our children’s greatest teachers. Children see. They watch. More than they learn from what we say, they learn from what we do. Though we Jews are known as the People of the Book, a people of words, we are more correctly a people of actions. The words we learn and the words we say are meant to inspire positive, even holy, behavior. Seder night is an evening filled with action. Actions that have the potential to give over the message of Pesach even more than the words of the Haggadah. Our children remember the words we say and sing throughout the seder, but they internalize, even if only subconsciously, our actions. They see if we’re excited about the holiday. If we are, most likely they will be too. They see how we say the words of kiddush. Do we say them with intent and meaning or just as something that needs to get done? Are we ourselves inspired by the telling of the story of Pesach or are we just trying to say the words quickly so we can get to the meal quicker? They even see how we eat the matzah. If we take the time to cherish that once-a-year moment of eating matzah on Seder night and try to connect to its depths, or just crunch it into our mouth and move on. Seder night is a night for parents to shine. For parents to sit with their kids intently and intentionally. To love them, respect them, make space for them, listen to them, inspire them, guide them and, most of all, share with them, through the telling of our people’s story, the beauty and deep significance of what it means to be a Jew. Akiva Gersh is the editor of the book "Becoming Israeli" (www.becomingisraeli.com), a compilation of blogs and essays that speak of the inspiring and the sometimes wacky and crazy experience of making aliyah. Akiva himself made aliyah in 2004 with his wife Tamar and they live in Pardes Hanna with their four kids. 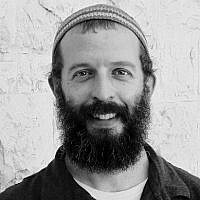 He teaches Jewish history at the Alexander Muss High School in Israel in Hod HaSharon. He is also a musician and in 2010 formed Holy Land Spirit, an uplifting and spiritual musical experience for Christian groups visiting Israel.